We just had a tsunami-triggering 8.2 earthquake off of Chile’s north coast, a 5.8 earthquake off the coast of Panama, a 5.1 earthquake in southern California, and a dormant volcano in Peru has awakened for the first time in 40 years, but scientists assure us that none of these events are related and that we don’t have anything to be concerned about. Even though all of these events took place on the Ring of Fire, which is the most seismically-active area of the entire planet, the “experts” promise us that “the odds are overwhelming” that they are not related to one another. So do you believe them? A few days ago, I wrote an article entitled “12 Signs That Something Big Is Happening To The Earth’s Crust Under North And South America“. This was before the earthquakes that struck off the coasts of Chile and Panama. It appeared to me, as a “non-expert”, that seismic activity was really starting to heat up in North and South America – especially along the Ring of Fire. But it turns out that I and everyone else that was concerned about all of these earthquakes was flat wrong. According to the experts, it is just a giant coincidence that earthquakes are popping off like firecrackers all along the west coasts of North and South America. “The odds are overwhelming that they’re not related,” said John Vidale, a seismologist with the University of Washington-Seattle, about the deadly magnitude-8.2 quake near Chile late Tuesday and the magnitude-5.8 quake near Panama on Wednesday. And another “scientist”, Robert Muir-Wood, tells us that there is “no evidence” that activity in one area of the Ring of Fire can affect activity in another area of the Ring of Fire. “There is no evidence of linkages in activity between different regions around the Ring of Fire,” said Robert Muir-Wood, a scientist with RMS, a catastrophe modeling firm. So if you are convinced that “the Ring of Fire is roaring to life”, you are just being delusional according to them. 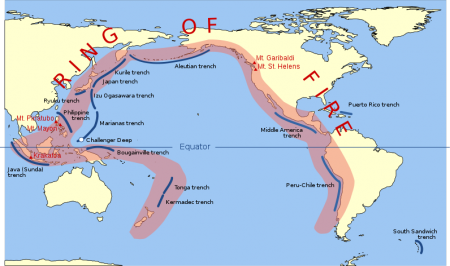 Known as the Ring of Fire, its fault lines run up the entire western coast of the Americas, from Patagonia to Alaska, and then heading southward again below the eastern Pacific, eventually ending between Asia and Australia. Of the 10 most powerful quakes listed by the US Geological Survey (USGS), all but one took place around the Ring of Fire. That accurately reflects the numbers, with 90 percent of all the world’s tremblers taking place here. The Ring of Fire is also home to most of the world’s active volcanoes. People were becoming extremely worried, because during the month of March there were hundreds of significant earthquakes along the coast of Chile. The concern was that this was leading up to something big. And sure enough, a massive 8.2 earthquake struck the other night. Since the 8.2 quake, there have been dozens of aftershocks measuring magnitude 4.0 or greater. But of course Chile is not the only area along the Ring of Fire that has been unusually active. There have been several dozen significant earthquakes in Peru over the past month, including a 6.3 earthquake that made headlines all over the planet. And as I mentioned above, a major volcano in Peru that has been dormant for about 40 years is now roaring back to life. And the west coast of North America has also been witnessing some very strange seismic activity lately. In early March, northern California was shaken by a 6.9 earthquake. It was the worst earthquake to hit northern California in about four years. Later in March, a 5.1 earthquake rattled Los Angeles pretty badly. It had been a long time since L.A. had seen anything like that. Further north, Mount Hood up in Oregon has experienced more than 100 earthquakes in recent days. Scientists are becoming increasingly concerned that an eruption may be coming. And just today, there have been more than a dozen significant earthquakes along the coast of Alaska. But according to the experts, the fact that all of this is happening at the same time is just a giant coincidence. They assure us that there is absolutely nothing to be concerned about. Hopefully things will settle down and go back to normal. None of us should want to see the kind of death and destruction that massive earthquakes could potentially bring to our coastal cities. But as I discussed in my article about the Yellowstone supervolcano the other day, it would be foolish to willingly ignore the warning signs. Many of the experts would have us believe that seismic activity is completely “random” and that there is no pattern to it. However, history has shown that seismic activity tends to happen in waves. When there is one event, the probability that there will be another event becomes greater. And when things have been quiet for an extended period of time, the probability that things will continue to be quiet becomes greater. Unfortunately, it appears that we have now entered a period of heightened seismic activity in North and South America – particularly along the Ring of Fire. Hopefully this particular wave of seismic activity will be short-lived and will soon cool down.